As the Commonwealth Games kick off in Glasgow today, we check out three athletes who are champions off the field as well as on it. There are some truly remarkable sports men and women who promote equality, fairness and justice. Here’s a few of our favourites. British athlete Mo Farah rose to fame with a series of impressive long distance wins in track events around the world. But Mo is also known for his philanthropic work. He’s set up his own foundation, which provides life saving aid to East Africa, as well as taking part in the 2012 Olympics Hunger Summit. 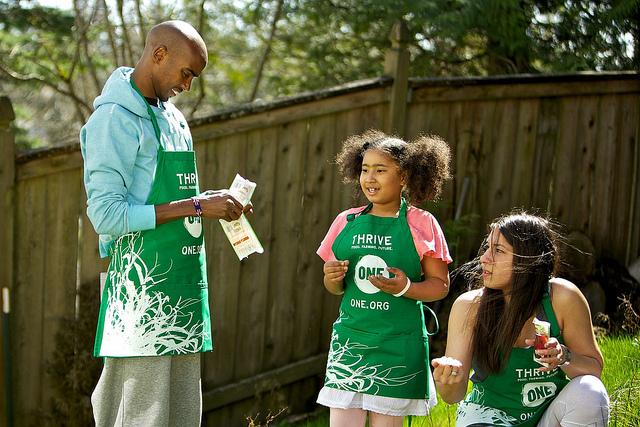 In 2010, Mo joined forces with ONE to launch Thrive, a campaign calling on everyone to play their part in breaking the cycle of hunger and poverty by tackling its root causes. Maria is from the Pashtun region in Pakistan. From an early age, and with the support of her parents, she starting taking part in sports. This was risky because as a girl, it was forbidden according to local religious customs. To compete in weightlifting events, Maria’s father dressed her as a boy and she adopted the name ‘Chingaiz Khan’. But for a squash tournament, she needed to produce a birth certificate and identify as a girl, leading to death threats being sent to her family. Undeterred, she dreamed of becoming a world champion squash player and eventually Jonathan Power (1999 World no.1 squash player) agreed to train her in Canada. Watch her impassioned TEDxTeen talk (above) on how everyone should be ‘like an eagle”, as her Dad said. Shelly-Ann Fraser-Pryce is a knockout athlete, who was the first Caribbean woman to win 100m gold at the Olympics. Her story is remarkable. She overcame poverty and followed her dream to win her gold medals. I have a passion for children and I make sure I set an example and become a role model for them because I understand completely how it is to be in poverty and understand how important it is to have someone that escapes that. The Glasgow 2014 Commonwealth Games is partnering with UNICEF to #PutChildrenFirst. This partnership aims to change children’s lives, using the power of sport to reach every child in Scotland and benefit children in every Commonwealth nation and territory. Find out more about UNICEF at the 2014 Commonwealth Games.